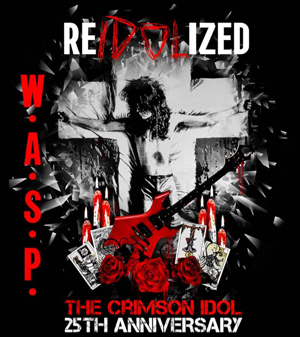 W.A.S.P.’s The Crimson Idol album - a classic that stands the test of time and was heralded at the time by both critics and fans alike - celebrates its 25th anniversary in 2017. In celebration of the milestone, Blackie Lawless and company will release a new re-recorded version alongside a 50-minute DVD film of the entire story. This will be the latest entry into the W.A.S.P. catalogue since their new album Golgotha was released in late 2015. The band has also announced the Re-Idolized: The 25th Anniversary Of The Crimson Idol World Tour. On the tour W.A.S.P. will perform The Crimson Idol in full, as well as 3 missing songs originally intended to be part of the recordings - accompanied by the film - followed by a second set of hits; the production and performance will be as powerful as fans have come to expect. The first 'Re-Idolized: The 25th Anniversary Of The Crimson Idol' dates have been revealed and you can check them out below.